Yamaha's MOX range offers unusually tight integration with your DAW. Is this the way forward for synthesizer workstations? 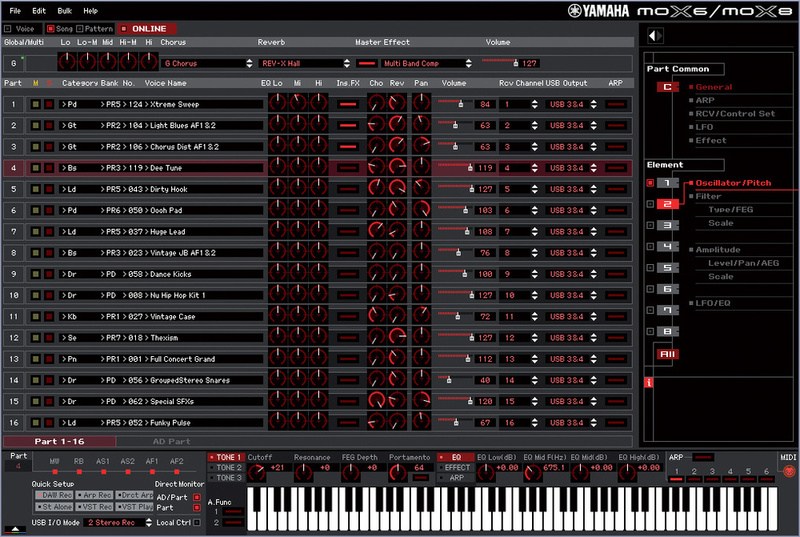 The MOX6 and MOX8 synthesizers are a subset of Yamaha's popular Motif range, borrowing the majority of their design from the Motif XS. Although having no onboard sampling or audio recording facilities of their own, they are designed to serve as the heart of a compact audio/MIDI music production system. Simply connect one via USB to a DAW-equipped laptop, add a microphone and a pair of headphones, and you have a keyboard-based recording setup that's light enough for one person to carry around. Both MOX models are of comparatively lightweight construction, so they're far more portable than your typical synth workstation. The 61-note MOX6 on review here, at a mere 7kg, can be lifted easily with just one hand. The 88-note MOX8 weighs in at 14.8kg, which may prove to be more than just a handful for some, but is still remarkably light for a weighted action keyboard. True portability would, of course, mean the option of battery power, however, the MOX requires mains power for its external 12V PSU, so producing smash hits in a rowing boat is probably not an option. The internal synth architecture of the MOX is essentially the same as the Motif XS — the two instruments even share the same sample ROM and Preset Voices. There are changes and additions to some menus, and occasional operational variances, but since none of them represent a drastic departure from the overall functionality of a Motif XS, this review will concentrate on the more immediate differences. If you are unfamiliar with the XS, the review in the October 2007 issue of SOS explains its features in some detail. The MOX6's back panel includes a pair of USB ports, MIDI In, Out and Thru sockets and (all on quarter-inch jack sockets) three footswitch inputs, a pair of stereo outputs, a pair of stereo inputs and a headphone port. Yamaha have kept the cost, size and weight of the MOX6 to a minimum in several ways. Most obviously, the construction is almost entirely of plastic. Despite this, it feels sturdy enough, without too much of the plasticky 'creaking' feeling you might expect. The synth-action keyboard has a shortened front-to-back scale and no aftertouch, there is no ribbon controller, the monochrome LCD display has the same 240 x 60 pixel dimensions as that of the Motif ES, and the real-time controllers comprise only eight knobs and no sliders. Most of the controls from the display to the right-hand end of the panel will be familiar to XS users; the most significant changes are all on the left-hand end. The functions of the eight control knobs vary slightly from the XS: there are fewer arpeggio and EQ parameters, replaced by chorus and reverb preset selectors, portamento time and volume. The volume knob serves as a substitute for the missing level faders; Part levels can be adjusted here, but only one Part at a time. A pair of long-overdue transpose buttons has also been included. The AF1 and AF2 buttons can now be controlled via a footswitch (hooray! ), so you no longer have to remove a hand from the keyboard when playing voices that feature sound variations assigned to these buttons. The audio input gain knob has moved from the rear panel to the top, with its own on/off switch. New to the MOX are an eight-segment LED meter and a DAW level slider. The meter can be switched to display either the audio input level or the signal level at the MOX's output (ie. the sum of the internal synth and incoming DAW audio, more on which later). The rear panel largely resembles that of the XS, but with one stereo output, one assignable foot-controller jack, and no S/PDIF output, Ethernet connection, or mLAN expansion slot. The USB To Host socket makes the latter three connections redundant, since it handles all the audio and MIDI communication between MOX and computer. The MOX Editor in Song (multitimbral) editing mode. In Cubase, the VST version of this editor is invoked simply by pressing the VSTi Window button on the MOX. There are a few economic concessions to the MOX's internal workings compared to the XS. The biggest cutbacks are the absence of any sampling facilities and the halving of the maximum polyphony to 64 notes. The number of Insert effects available in song and mixer (ie. multitimbral) modes has also been reduced from eight to three. While these limitations obviously restrict how much the MOX can do at once, the whole point of the MOX is that tracks can be rendered as audio direct to your DAW, and their MIDI tracks archived. Insert effects can be reassigned as and when instruments require them, and those instruments rendered to audio. It's not all about cutbacks, though: 87 new arpeggios bring the total to 6720, the sequencer's capacity has been almost doubled, to 226,000 notes, and the Favourites category has its own dedicated button for quick recall of frequently used Voices. Performances consist of up to four parts, which can be layered and/or split, with independent arpeggiators available for each Part. 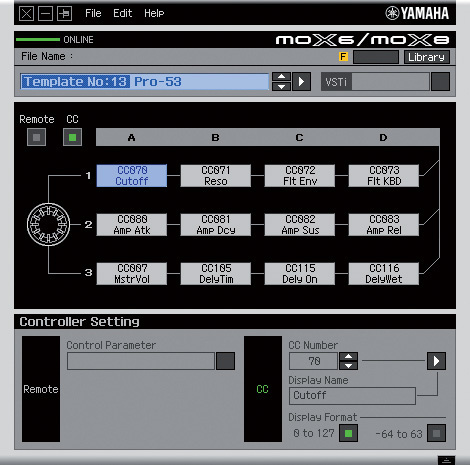 Many MOX preset Performances include arpeggiators to provide rhythmical synth textures, automated bass parts and drum patterns, and can be useful sources of songwriting inspiration. Performance Creator is a new fast-track tool for making your own multi-layered Performances. Using any Voice as the starting point, pressing Layer invokes the Category Search window. Choose the desired sound category and Voice, press Enter, and that Voice is automatically layered with the first Voice, assigned to Part two. Adding a bass with a keyboard split to the third Part is just as easy: pressing Split invokes the Category Search window again, which now includes split point and upper/lower parameters. Choose whether you want the new Voice to be above or below the split point, and you're done. Pressing Drum Assign adds a drum kit with an arpeggiated drum pattern automatically activated (drums are always given to Part four). If you want to change the drum pattern, just hit Arp Edit and select a style and pattern from the vast number available. The Remote Editor allows editing of the MOX's 50 control templates, and the creation of custom templates for controlling your own soft synths using the knobs on the MOX. The USB To Host connection enables MIDI and audio data communication between the MOX and a computer. The MOX functions both as a synth and a soundcard/audio interface, so no additional hardware is required. It's capable of transmitting up to four simultaneous channels (as two stereo pairs) and receiving two channels (your DAW's stereo output). Audio routing within the MOX is straightforward: there's an option to transmit just the first audio pair, or both together. Generally, signals from the MOX's audio input travel down the Stereo 1 pair, while synth sounds appear on Stereo 2, making it possible to record a vocal and the MOX's performance together, onto separate tracks of the DAW. Each MOX sequencer Part can also be routed to either stereo pair, so by hard panning instruments you can record up to four mono parts at once to separate audio tracks. The MOX also acts as a remote control for your DAW, the level of functionality depending on which DAW program you're using (see the 'DAW Remote Control' section elsewhere). And as you'd expect, the MOX speaks fluent MIDI, handling all 16 channels in both directions. To access all these features, it's necessary to install the latest Yamaha USB driver on your computer. Once installed, the MOX will appear in the DAW's device lists: four MIDI inputs and outputs, two stereo audio inputs with mono L/R options for each stereo pair, and one stereo output. MIDI note data is handled by MIDI port 1, while DAW remote-control data is addressed over MIDI port 2. The Yamaha driver has no problem co-existing with other MIDI drivers, but you may well find it necessary to deactivate other audio drivers your DAW uses. This was the case for me in Sonar, where the Yamaha audio drivers were unavailable until my usual soundcard's drivers had been deactivated. After that, everything went swimmingly — audio could be recorded from both MOX audio ports, and Sonar's audio output appeared in all its glory at the MOX's stereo output jacks. Different audio routings and MIDI settings may be needed according to the task in hand, so the MOX provides instant access to six Quick Setups pre-configured to the most likely scenarios. Any of these can be customised to your own requirements and stored to any of the six Quick Setups, saving time and menu-surfing when you're on a roll. A full description of the Quick Setup configurations can be found in the MOX support section at www.motifator.com/index.php/support/mox_articles. The MOX's audio sample rate and bit depth, incidentally, is fixed at 44.1kHz, 24-bit. Tests with varying ASIO buffer sizes showed that 256 samples gives a fairly respectable 5.8ms latency for running other plug-in synths without clicks or drop-outs. The workstation can monitor its own audio directly with zero latency. Whether using Cubase or not, anyone can create templates for controlling soft synths, using the Remote Editor. Here's one I made earlier for M-Tron Pro. The MOX can remotely control DAW functions, and includes remote-control templates for Cubase, Sonar, Logic Pro and Digital Performer. Users of non-Steinberg DAWs must manually configure their DAW's control-surface settings to match, typically using the basic Mackie Control template. If you're using Cubase with the MOX6/MOX8 Remote Tools software installed, the MOX will automatically configure Cubase's remote control setup for you. I set it up to work with Sonar, which responded correctly to the MOX's transport control functions, with the exception of the 'return to zero' button and the AI data dial. The MOX also has 50 templates for controlling a range of popular soft synths via its control knobs. The functions of each knob vary according to the selected synth template, and cycle around three rows of parameters using the knob 'function' buttons. All eight knobs are operational if you're using Cubase, but only knobs 1 to 4 will work with non-Steinberg DAWs. On trying this feature with a number of synth templates for which I have the software, everything worked exactly as intended. Knobs 5 to 8 give Cubase users access to additional remote functions, the specifics of which depend on the selected template. True portability implies something you could easily use on a bus or a plane, which clearly isn't possible in the case of the MOX. However, the MOX6 is certainly light enough to carry around in a gig bag along with a laptop without too much hassle, making an ideal combo for hotel-room writing sessions, recording band rehearsals, or capturing moments of inspiration just about anywhere there's a mains supply to hand. The MOX is, of course, a highly capable synth in its own right, equally at home as a principal part of an on-stage keyboard rig or in any recording situation — and one your roadie will appreciate, too. If you're looking for alternatives to the MOX purely as a stand-alone synth, the Motif XS and XF are obvious choices, as they share much of the same functionality and all their synthesis architecture. Beyond Yamaha, synths such as the Korg M50, Roland Fantom G-series and Kurzweil PC3 offer similar synth/sequencer packages. However, the MOX is currently unique in its compact approach to recording audio and MIDI combined with DAW control and VST instrument compatibility. As with previous Motifs, Yamaha's Studio Connection concept brings full integration with its 'Total Recall' environment to the MOX, when used in conjunction with a Steinberg DAW such as Cubase. To get the full benefit, several pieces of software in addition to the Yamaha USB driver are required: firstly, Cubase or one of its stablemates (e.g Cubase AI5), MOX6/MOX8 Remote Tools, Studio Manager and MOX6/MOX8 Editor VST. 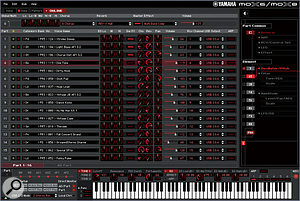 All can be downloaded from www.yamahasynth.com/downloads. Remote Tools comprises two items. The first is the MOX6/MOX8 Extensions. This enables Cubase to detect an MOX synth, enable the ASIO driver and configure all the I/O ports, and provides integration of the MOX as a remote controller for Cubase and installed VST instrument plug-ins. Secondly, the Remote Editor allows you to edit the existing synth remote-control templates and to create your own. Steinberg DAW users can create templates that include DAW and synth control, while non-Steinberg users can only create synth templates. Nevertheless, the ability for all users to customise the MOX to control a selection of their favourite VST instrument plug-ins is not to be sneezed at. Studio Manager acts as host and 'organiser' for a range of software editing programs for Studio Connections compatible devices — ie. most Yamaha equipment — and can be accessed from within Cubase. The MOX can be run as if it were a VST instrument within Cubase, and MOX6/MOX8 Editor VST is intended specifically for this application. The obvious advantage of running the MOX as a VST intrument is Total Recall — all its current settings are stored with a project. Any edits made on the MOX's own panel update the on-screen editor accordingly, and vice versa. Without Cubase, it's still possible to enjoy a pretty well-integrated MOX by installing Studio Manager and the non-VST version of the MOX6/MOX8 Editor. The Editor is accessed from within Studio Manager, both running as stand-alone programs alongside your DAW. It just means you have to manually start them up and manually save their settings, rather than having the 'symbiotic' VST integration offered by Cubase. Not wanting to miss a trick, Yamaha bundle Cubase AI5 with the MOX for free, together with free downloads of Steinberg's Prologue synth and YC3B Hammond clone, so the joys of full integration can be experienced by all. Well, nearly all. AI5 must be registered online, even before you can use it as a time-limited demo, then activated to make its use permanent. However, registration and activation can only be done via the included e-licensing software, which requires the computer on which you've installed the software to be online — there is no facility for doing it from a different computer. Although it's unlikely for a laptop not to be web enabled, there are still people out there who choose to keep their main studio computer safely isolated from the web. Surely it would be preferable to be offered alternative methods of activating software, so you can keep your studio setup web-free? Motif XS-style synthesis in a lightweight package. Audio recording and playback using a computer connected via a single USB cable. Full DAW and VSTi integration when used in tandem with a Steinberg DAW. An impressive amount of synth and DAW control even with non-Steinberg software. To get the full complement of DAW and VSTi integration, you need to be running in tandem with a Steinberg DAW. Portability reliant on having a mains supply available. Despite its need for mains power, the MOX6 makes an ideal centrepiece for a portable recording setup. Although light enough to carry around in a gig bag with little effort, it's still a serious Motif-style workstation keyboard in its own right. It should prove valuable not only as a main gigging and recording instrument, but also as a means of capturing instrumental and vocal ideas into a DAW-equipped laptop, without the need for additional audio or MIDI hardware. MOX6 £1048; MOX8 £1614. Prices include VAT. Yamaha Music +44 (0)844 811 1116.